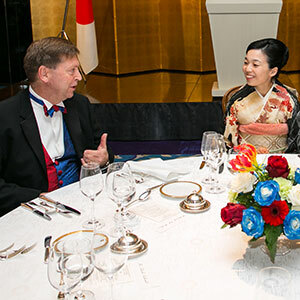 The VIP table included HIH Princess Akiko (left), Ambassador Tim Hitchens CMG LVO, and former Japanese Ambassador to the UK and JBS Chairman Yoshiji Nogami (right). 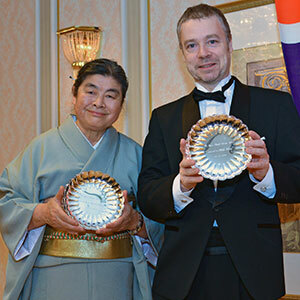 The Japan–British Society (JBS) held its annual gala dinner on 25 November at the Imperial Hotel Tokyo, featuring two awards and a special commemorative gift presented by HIH Princess Akiko of Mikasa. 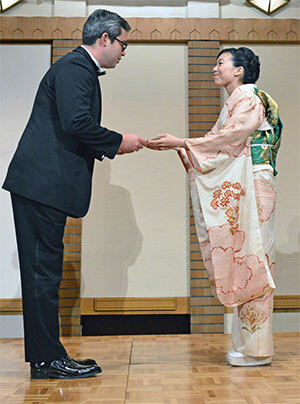 A guest speech was given by award-winning economist, author, broadcaster and Japan expert Peter Tasker. Based in Oxford and Tokyo, he first came to Japan in 1977. 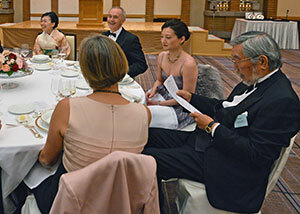 British Ambassador to Japan Tim Hitchens CMG LVO—the JBS president—and JBS Chairman Yoshiji Nogami were among the 116 guests, as were a number of Japanese former ambassadors to the UK. 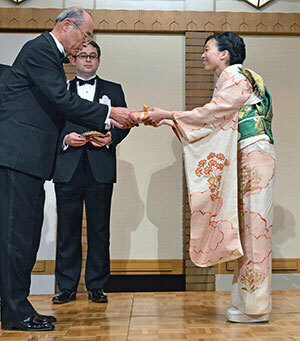 Each year, the JBS recognises “significant work in the field of Japanese–British relations by individuals and organisations that has not otherwise been acknowledged”. 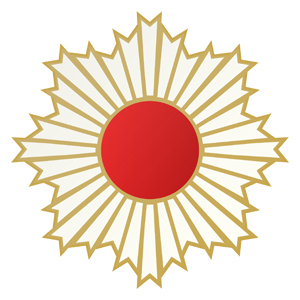 One Briton and one Japanese are awarded. Founded in 1908 “to encourage the study of things British and promote cordial relations between the peoples of the United Kingdom and Japan”, the JBS has about 2,000 members and is supported by some 100 Japanese and British firms. 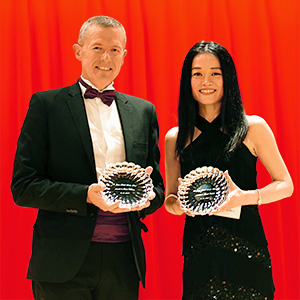 Simon Farrell has been publisher and editor-in-chief of BCCJ ACUMEN, the magazine of the British Chamber of Commerce in Japan, since launching it in 2009. The business and lifestyle publication has developed from a bi-monthly, members-only format to a monthly magazine with a readership of some 60,000 in Japan and abroad. It is widely distributed, including insertion with the Financial Times, and can be found at airports in Tokyo, Hong Kong and London. By featuring a wide range of UK- and Japan-related articles on business, lifestyle, culture, arts and sport, Farrell has greatly contributed to a better understanding between the two countries. He also carries out extensive pro bono work for UK-run charities in Japan. Naoki Alex Miyaji has been the central figure for making the very British game of cricket better known and widely played in Japan. Partly thanks to him, nationwide there are now more than 3,000 cricket players, including those at about 30 university cricket clubs. Miyaji was first selected to represent Japan’s cricket team in 2000, after having played in several countries. In 2008, he became chief executive officer of the Japan Cricket Association, where he was instrumental in setting up the Cricket for Smiles development programme in Tohoku. Cricket for Smiles is designed to bring joy to children who suffered in the 2011 Great East Japan Earthquake and tsunami. Katsuaki Wada served as Japan–British Society executive secretary from 2004 to September 2015. The JBS board decided to express their appreciation by presenting Wada with a commemorative gift for his long and dedicated service to the society. Throughout his long service, he has made a great contribution to the activities and management of the JBS, especially through his unprecedented, self-sacrificing work to change the body’s legal status in 2012 and relocate its office.